Explore the wonders of science with this informative and exciting lab demonstration DVD. 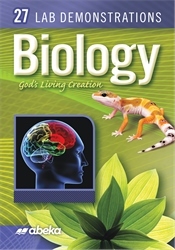 All twenty-seven biology labs have been carefully worked out in this DVD so that your child can experience firsthand every experiment without having to buy all the tools necessary to perform them. From dissecting to taking a closer look at a leaf under a microscope, these demonstrations will give your child a deeper knowledge of the wonderful world of science.